Heavy Duty Foot Stool, Foot Stool, Around the House Aid, 13037-1sv, Drive Medical. Heavy Duty Foot Stool, manufactured by Drive Medical, is a durable bariatric foot stool capable of holding a generous amount of weight. You may select this foot stool to give you a boost around the house to gain access to those hard-to-reach areas. 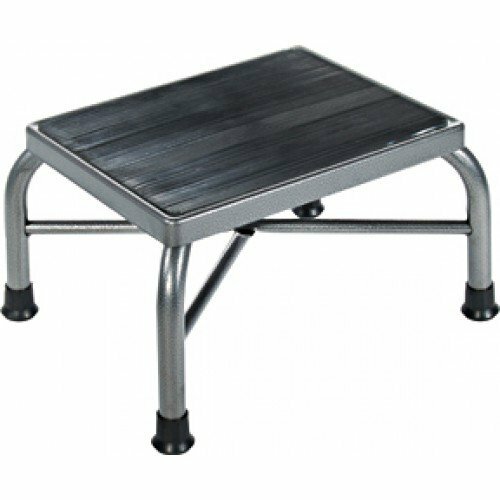 Featuring a cross brace attached with aircraft rivets and 1" steel tubes, the Heavy Duty Foot Stool provides the strength that you require. 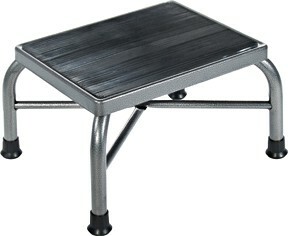 In fact, the Heavy Duty Foot Stool can withstand a weight capacity of up to 500 pounds. In addition to being incredibly sturdy, the Heavy Duty Foot Stool is amazingly stable, too. This foot stool features a non-skid rubber platform that provides the user a stable surface and prevents accidental falls. Additionally, Heavy Duty Foot Stool does not require tools for assembly. You may purchase this foot stool with or without handrails. If you are interested in this stool with handrails, please check out Heavy Duty Foot Stool With Handrails. Available with or without handrails. Manufactured with 1" steel tubing. Safely supports a generous amount of weight. Application: To assist with reaching those hard-to-reach areas.